In the wake of the Christchurch tragedy, New Zealand has felt the eyes of the world upon them. None more so than their Prime Minister, Jacinda Ardern. Ardern’s courageous and compassionate leadership has helped her country, if not the world, come to terms with this senseless and horrific mass shootings. Some have described Ardern’s leadership as ‘pitch perfect’, but I believe the opposite to be true. It’s that fact that she hasn’t been perfectly polished, cautiously scripted and calculated in her responses that has been her true strength. She is not some mythological creature. She is human, and she has lead with humanity and humbleness. She has lead from the heart. As business leaders we are unlikely to ever confront the magnitude of the crisis that faced the New Zealand’s Prime Minister, however we lead our teams through growth, change and conflict every day. So what can we learn from Ardern’s leadership style and actions, that would make us better leaders? Trust is not something you gain overnight. It was Ardern’s valued-based, humble and humanistic approach to leadership that saw her gain the trust of the nation. So much so that only two months after becoming the leader of her party, she became the country’s youngest female Prime Minister ever. Since then Ardern has worked to deliver on her promises and kept true to her values. Nothing speaks more loudly than when a leader’s actions reflect their words. I’ve written several times about the need to treat your staff like adults. It is easy as leaders to get caught up in knowing what is best for our staff. How often I’ve seen those assumptions make a situation worse. The day after the Christchurch killings, Ardern, wearing the head scarf, wasn’t sitting in her office with advisors deciding what to do. She was out with the Muslim community, asking them what they would like her to do. “Our time is for you to determine”, she said. Then she listened! As a leader it is sometimes hard to care. People let us down. It’s easier to make the hard decisions if we don’t care too much about the people who are impacted. But how can we ask people to trust and follow us, if we don’t demonstrate that we care about them? Unfortunately society still considers outward displays of emotion and empathy as a female trait and not something we should do if we want to be seen as a strong leadership. In the past critics have told Ardern that her openness and empathy make her a weaker leader. I would defy anyone who now does not see Jacinda Ardern as a powerful world leader, regardless of her gender. We’ve all seen it. In the absence of information, people create it, often in a way that is lacking in objectivity. You don’t have to have all the answers right away, but providing information regularly, using real language will reduce the likelihood of rumours and provides a sense that trust. If your staff can understand what is going on, they feel safer and more in control. Yours will be the voice they will look to and trust. To move your team through change, or a crisis, staff need to have an expectation that you are moving towards something. Even in the face of adversity, people can move forward if they are provided with a call to action they can believe in. Show them where you are going and why. Help them to understand what their part is in helping you get there. In amongst the grief and confusion, Ardern has helped her people understand how they can be stronger and taken action to prevent this from happening again. Is Jacinda Ardern a perfect leader? No. Her time in office has seen missteps and errors in judgement like the rest of us. No leader is perfect, that is part of being human. 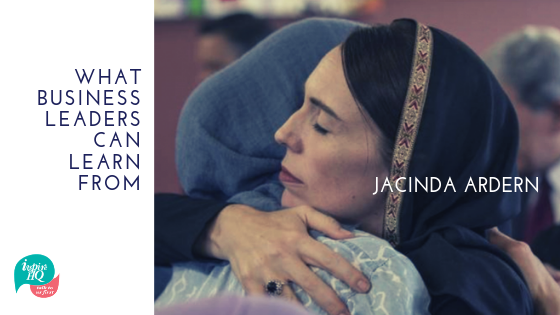 What Jacinda Ardern has done is guided her country and her people through its worst crisis, in a way that is compassionate, inclusive and healing. And in doing so, she has showed the rest of us how to do the same. Claire Huntington has over 15 years’ experience in senior and executive level human resource management and strategic leadership positions. Claire learnt HR under the wings of great mentors and through trial and error. She has a very practical hands-on approach to HR and management, and isn’t afraid to look outside the box. Claire is also mum to three primary-school aged firecrackers and is an avid photographer in her spare time. Disclaimer: The material contained in this publication is of a general nature only. It is not, nor is intended to be, legal advice. If you wish to act based on the content of this publication, we recommend that you seek professional advice.